Station for the Mass of Monday after the First Sunday of Lent is the collecta of Saint Cosmas and Damian. Pope Felix IV (526-30) constructed the basilica where the collecta in honor of the two celebrated Eastern doctors, Sts. Cosmas and Damian, takes place. During the Byzantine period it was held in very great veneration, and crowds flocked to the sanctuary of the two martyred physicians as to a sure source of health. The chains of St. Peter are preserved at the Basilica in exsquiliis, dedicated by Sixtus III to the Apostles Peter and Paul; the relics of the seven martyred Machabees are preserved under the altar. The Chains of St. Peter are kept there; those of St. Paul are at the Ostian basilica. The Prayer begs almighty God to illuminate our minds with His heavenly light, so that the Lenten fast may not only discipline our bodies, but may render our souls both contrite and earnest. The Lesson from Ezechiel describes a scene frequently reproduced in the cubicula of the ancient cemeteries. It teaches the docility with which the soul entrusts itself to the care of the divine Shepherd, keeps it from all danger, and renders it the object of his heart’s tenderest solicitude. 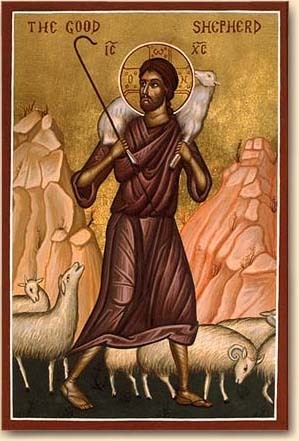 In the OT Lesson, Our Lord Jesus Christ is the Shepherd who comes to seek His lost sheep; an allusion to the penitents about to be reconciled at Easter and to the Catechumens preparing for baptism. The Gospel from St. Matthew tells us of the separation that Our Lord Jesus Christ, the divine Shepherd, will make forever between the sheep and the goats, or between the good who repent and give themselves up to works of charity, and the sinners. Convert us, O God, our salvation, and, that the Lenten fast may profit us, instruct our minds with Thy Heavenly instruction. Through Jesus Christ our Lord, Who liveth and reigneth with Thee in the unity of the Holy Ghost, one God Forever and ever. R.Amen. Lesson from Ezechiel the Prophet. Thus saith the Lord. Behold, I Myself will seek My sheep, and will visit them. As the shepherd visiteth his flock, in the day when he shall be in the midst of his sheep that were scattered; so will I visit My sheep, and will deliver them out of all the places where they have been scattered in the cloudy and dark day. And I will bring them out from the peoples, and will gather them out of the countries, and will bring them to their own land; and I will feed them in the mountains of Israel by the rivers, and in all the habitations of the land. I will feed them in the most fruitful pastures, and their pastures shall be in the high mountains of Israel: there shall they rest on the green grass, and be fed in fat pastures upon the mountains of Israel. I will feed my sheep, and I will cause them to lie down, saith the Lord God. I will seek that which was lost: and that which was driven away I will bring again; and I will bind up that which was broken: and I will strengthen that which was weak; and that which was fat and strong I will preserve: and I will feed them in judgment, saith the Lord almighty. Behold, O God, our protector, and look upon Thy servants. V. O Lord God of hosts, graciously hear the prayers of Thy servants. I will lift up my eyes, and consider Thy wonders, O Lord, that Thou mayest teach me Thy justices: give me understanding, and I will learn Thy commandments. Sanctify the gifts offered to Thee, O Lord, and cleanse us from the stains of our sins. Through our Lord Jesus Christ Thy Son. Who liveth and reigneth with Thee in the unity of the Holy Ghost, one God Forever and ever. R.Amen. Amen I say to you: what you did to one of My least ones, you did to Me: come ye blessed of My Father, possess the kingdom prepared for you from the beginning of the world. Regaled with the gift of Thy salvation, O Lord, we, Thy suppliants, pray to be renewed by the effect of that by the taste of which we are gladdened. Through our Lord Jesus Christ, Who livest and reignest, with God the Father, in the unity of the Holy Ghost, one God For ever and ever. R. Amen. Loose the bonds of our sins, we beseech You, O Lord, and mercifully turn aside whatever punishment we deserve for them. Through our Lord Jesus Christ, Who livest and reignest, with God the Father, in the unity of the Holy Ghost, one God For ever and ever. R. Amen.